Thinking about having building work performed on your home? 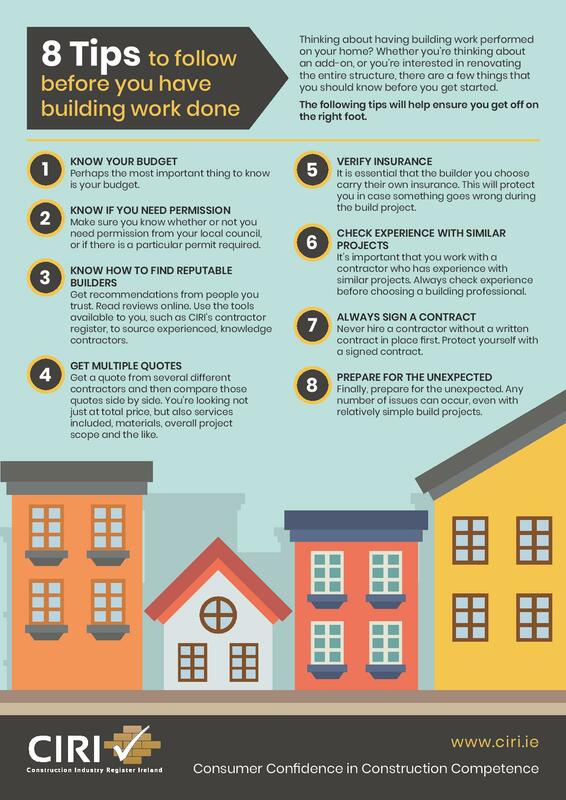 Whether you’re thinking about an add-on, or you’re interested in renovating the entire structure, there are a few things that you should know before you get started. The following tips will help ensure you get off on the right foot. Materials – Materials will encompass a significant percentage of your budget, and those costs will increase with higher-end materials. For instance, natural stone countertops will cost significantly more than going with a synthetic material like Corian. Site prep work necessary (if applicable) – If you will be completing an extension or add-on, you will usually need at least some site prep work done. This usually includes things like levelling the earth in the area where construction will occur, as well as ensuring adequate drainage away from the structure. Products used (appliances, for instance) – Any appliances, fixtures, or other products used in your build will have a direct impact on your costs. For instance, a new range, a new toilet, a new shower – these will all increase your costs. As with materials, higher-end items will have a larger impact on your overall costs. Location (material costs vary between geographic areas) – You would assume that building materials would cost the same across Ireland, but that is not true. Your geographic area plays a role in what you’ll pay overall. Labour – Finally, you have the labour involved in the project. You can expect to this to take up around 50 per cent of your total costs. You can cut down on that by doing some (or most) of the labour yourself, but that may or may not be the right option, particularly if you have little or no experience as a builder. Create a rough budget for yourself before you do anything else, even contacting potential builders for quotes. Next up, make sure you know whether or not you need permission from your local council, or if there is a particular permit required. On certain types of projects, you may need building regulations approval or planning permission. Once you have your budget established and have determined whether there are any permissions necessary, it is time to start looking for builders. This is a vital step in the process and not an area where you can cut corners. Get recommendations from people you trust. Read reviews online. Use the tools available to you to source experienced, knowledge contractors, such as CIRI’s contractor register. Our database is searchable and allows you to easily locate builders who conform to strict standards in quality, knowledge, and expertise. Finding the right contractor is not always a simple thing. Always look for proof of competence, but you should go deeper. Get a quote from several different contractors and then compare those quotes side by side. You’re looking not just at total price, but also services included, materials, overall project scope and the like. It is essential that the builder you choose carry their own insurance. This will protect you in case something goes wrong during the build project. Accidents can lead to injuries, and those should be concerns, but you also need to worry about materials and workmanship cover, too. It’s important that you work with a contractor who has experience with similar projects. By similar, we mean more than just the basics. For instance, a contractor who has handled small bathroom renovations might be able to handle installing a new sink in your kitchen, but what about other appliances, such as a range, dishwasher or vent hood? What about the scope of the project, which would affect everything from sourcing materials to scheduling work? Always check experience before choosing a building professional. Never hire a contractor without a written contract in place first. Contracts spell out exactly what is to be done within a project and hold both parties accountable. If you go into a building work project without a written contract, you have no way of holding the contractor accountable should things not go to plan. In fact, you likely have no proof that there was a plan at all. Protect yourself with a signed contract. Finally, prepare for the unexpected. Any number of issues can occur, even with relatively simple build projects. Delays in material availability and delivery, waits for inspections to occur, accidental damage to materials requiring replacement, and many other things can add time and frustration. Always add in a bit of extra time and money to account for these occurrences. In the end, enjoying a successful conclusion to a building project is not all that difficult. You just need to bear the simple tips above in mind. Create a budget so you know what you can afford, check if you need planning permission, and make certain you are working with the right builder. Planning a renovation? -Do some research! Below you will find a glossary of the key terms used in the CIRI website to describe construction work. For the purposes of Building Control Regulations a builder is the competent entity undertaking to construct, and certify, the construction of building works. A builder is defined as an entity with a single point of responsibility under a prime contract in its totality for a client, or for delivery for sale, of buildings and building works including associated services and specialist elements. A single domestic residential unit, including related services. A number of detached, semi-detached, or terraced residential units (but not apartments or duplexes) forming a single estate, including site infrastructure and associated services. One or several multi-user residential building(s) containing individual apartments and common areas, including site infrastructure and associated services. An extension and/or refurbishment of a single residential unit or group of residential units. A building other than a residential building, including any building developed for industrial or public purposes. Including but not limited to occupancies for assembly, business, education, institutions, food sales and service, merchants and storage. An extension and/or refurbishment of a Commercial Building (as defined above). A Fit-Out comprises internal works only to a shell & core or existing Commercial Building (as defined above) to provide accommodation and services for an end user, or occupier. The specialist conservation and restoration of heritage projects and sites. The construction, upgrading, and maintenance of infrastructure and facilities in the areas of roads, bridges, transportation, structures, environmental, water, ports and harbours and rivers but excluding site infrastructure forming part of a commercial or residential development. Electrical, mechanical, and lifts (vertical transportation) contractors who contract, or subcontract under a secondary contract, to provide electrical and mechanical services to builders and/or directly to clients in new or existing residential and commercial buildings. Contract or sub-contract under a secondary contract to provide specialist services to builders and/or directly to clients.